Our mini digger hire service is reliable and we offer our plant machines with or without driver depending on your preferences. We also cater for skip loading dumpers so no matter what your plant hire requirements are we are sure that we will be able to accommodate your needs. Daily and weekly hire available for your convenience! 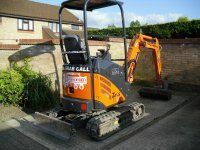 Stansted Plant Hire is known for providing excellent service at competitive rates. We guarantee all of our machines are in good condition and are more than willing to tailor our services to meet your needs. We welcome both commercial and domestic clients based in the areas of Stansted, Bishops Stortford, Chelmsford, Harlow, Basildon and Brentwood. Interested? Give us a call today on 07782 126105 or 01279 812821 for a service that will not let you down.